For an earth restored and a world at peace. 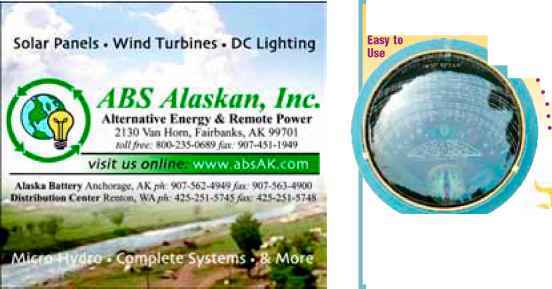 Specializing in Independent Electric Power for the Remote Home where utility power is not available. For 26 years, your questions have been personally answered by the good folks at Backwoods Solar that use these products everyday. 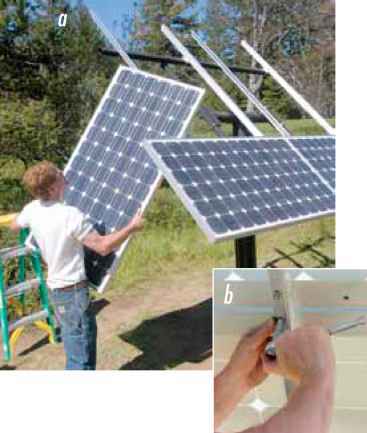 Our catalog / planning guide teaches the basics of installing solar, wind and hydro electric residential power and we offer free system design service either by telephone, email, or your visit to Backwoods. We can also refer you to solar helpers around the country. 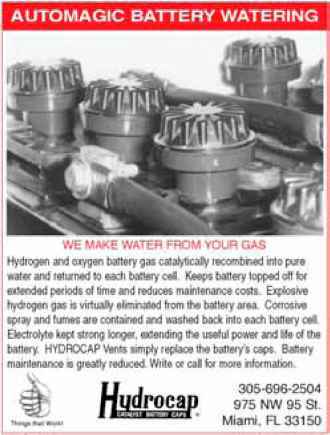 185 PAGE CATALOG / PLANNING GUIDE Free to Home Power readers in the U.S.A. Ingenious design projects your horizon onto a sun chart for the full year. Includes sun paths from 0-66° North & 0-49° South. With metal case & tripod $255, Handheld $175, (+S&H). Visit www.ases.org or www.nationalsolartour.org for a tour near you. Enjoy the tour, then go to www.FindSolar.com to explore energy improvements for your home and a directory of solar professionals in your area. See homes and buildings featuring solar electric and solar thermal technologies, passive design and energy efficient construction practices. Visit www.ases.org to find a National Solar Tour event near you. 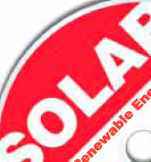 Most Solar Tours take place Oct. 1. Many tours are scheduled September through November. Pick up an official National Solar Tour handout for a 30% discount coupon for SOLAR TODAY magazine, or 35% off membership in the American Solar Energy Society. 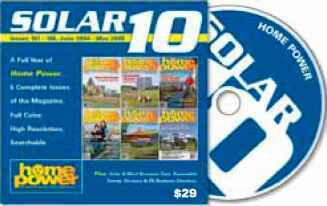 SolarlO is the latest addition to Home Powers CD-ROM-based back issue archive. 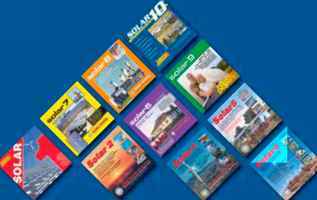 Subscribe or renew for three years and we'll send you our new SolarlO CD-ROM free. That's 106 PDF back-issues and much, much more. 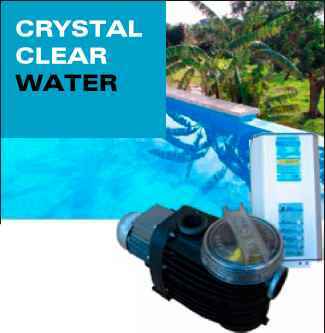 See homepower.com/CDset for complete contents information. All CD-ROMs contain original magazine layouts as published. Back issue files are provided in Portable Document Format (PDF)—searchable, exportable, and printable. 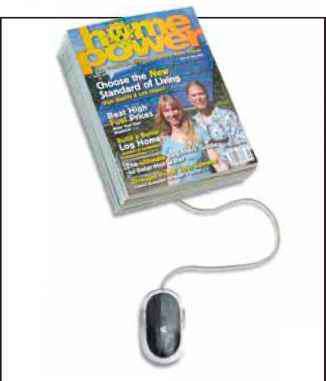 150 of the Best Articles on the Basics of Renewable Energy from the First 15 Years of Home Power Magazine. To learn more or to get started, visit..
* Requires Adobe Acrobat Reader 5.0 or later and an e-mail address. 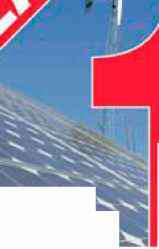 Pole-mounted solar-electric (photovoltaic; PV) arrays are a great option for many sites. You don't need to worry about the orientation or angle of an existing roof, or about roof penetrations. Pole mounts allow easy, manual adjustment of the array's tilt angle, or you can choose automatic tracking mounts to optimize energy production. They provide great air circulation to keep PV temperature down and power output up during warm weather, and make clearing snow off the array a simple task in wintry climes. 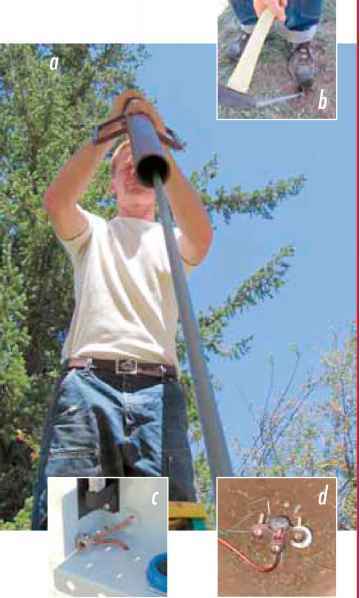 Last issue, I covered the groundwork—setting the pole. This time, I'll walk you through each step of the array assembly and wiring. 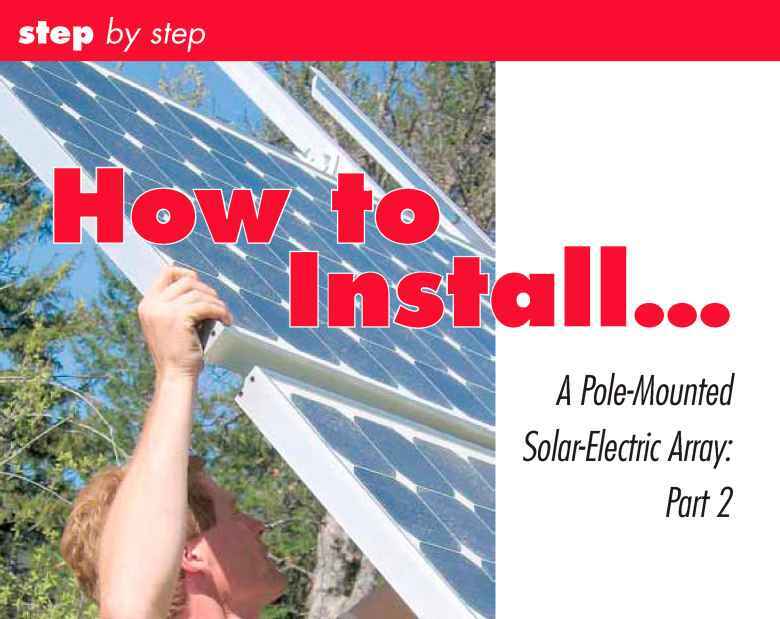 Even if the equipment you use is different than mine, the information will be a useful installation guide for your own pole-mounted PV array. Most pole mounts are designed and manufactured for specific PV modules. When you contact your mount supplier, they'll need to know the brand, model, and quantity of PV modules planned for your system. Each mount will come with step-by-step assembly instructions. Getting your mount assembled on the top of the pole is as easy as following the directions, but I have a couple of tips that will help simplify the job. First, don't fully tighten the bolts that fasten the PV-mounting rails to the rest of the structure until all of the modules are in place. This will give you some wiggle room if any of the predrilled mounting holes in the rack are a little off. Don't forget to fully secure the rail hardware once the PVs are in place. Second, pole mounts are designed to allow seasonal adjustment of the tilt angle of the array. 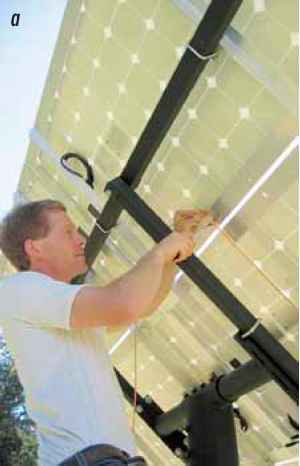 While you're installing the array, it can be laid flat, at close to vertical, or anywhere in between. In general, I like to set the angle of the array at about 45 degrees. This limits the amount of uncomfortable overhead work. If the array is mounted on a tall pole, securing it in a horizontal position will make the whole array easier to reach. Once the rack is assembled, it's time to install the PVs. If you're assembling the array while it's fixed in a tilted position, install the bottom row of PVs first. Then you can rest the next row of modules on the first row while you're positioning them, which makes the job faster and easier. The mounting hardware for the PVs will be included with the rack, not the modules. This hardware should be stainless steel to resist corrosion, and include either lock washers or lock nuts that will not loosen over time. It's easier to work with the mounting hardware if you insert the bolts through the module mounting holes from the inside of the PVs, and then through the rack. This gives you better clearance to get the washers and nuts in place. An open-end wrench used in conjunction with a ratchet and socket (usually 7/16 inch) will allow you to quickly fasten the PVs to the rack. If you have a big array, or several to install, a cordless drill fitted with a socket driver will definitely speed up the job. If you use this approach, make sure to set the driver's clutch to release before the hardware is overtightened. If you don't, you may snap off bolts. The National Electrical Code (NEC) requires a dedicated breaker or fuse in line with each series string of PV modules (except with some high voltage inverters). To meet this code requirement, a combiner box is required in most pole-mounted array installations. 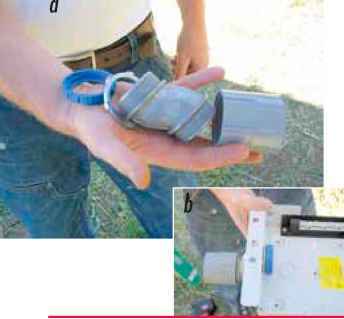 First, determine what conduit fittings you'll need to connect the combiner box to the conduit that runs up the pole. I typically run the conduit right against the pole. To make the transition from the conduit to the combiner box, you'll need a PVC female fitting, an offset, a nut, and a bushing. 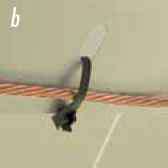 Single-hole straps (clamps) are used to secure the conduit. Another channel and strapping system using Unistrut (not shown) is commonly used to secure the vertical length of conduit to the pole. This is a good approach, but requires a few more fittings. Attach the conduit fittings to the combiner box finger-tight, and position the assembly on the conduit (no glue yet). Grab a marker and a torpedo (short) level. Adjust the offset until the back of the combiner box rests evenly against the pole, and then level the box. Now that everything is in position, mark the location of the mounting holes on the pole itself. Depending on the size of the pole and the combiner box you're using, the box's predrilled mounting holes may not be positioned where you need them. If this is the case, line it up where you want it, and mark the back of the combiner box to predrill custom mounting holes. Then mark the location of the new holes on the pole. Use self-tapping screws to fasten the combiner box to the pole (I prefer square-drive screws). Even with self-tapping screws, pilot holes are necessary when mounting to steel pipe. Make sure to choose a drill bit that is slightly smaller than the screws you use. The curve of the pole will typically cause your pilot bit to drift off your mark, so use a center punch to make a starting point for the drill bit. This will ensure that everything lines up when you fasten the box to the pole. Once your holes line up, apply PVC glue to the conduit, and slide the combiner box/fitting assembly into place. Wipe off any excess glue and drive the screws. I always neatly apply some high-quality 50-year silicone caulk over the screw heads, and seal any unused, predrilled mounting holes in the back of the box. Finally, use straps to secure the vertical conduit to the pole. All PV arrays need to be properly grounded per the NEC. Pole-mounted PV array equipment-grounding systems have three main components—lugs that attach the ground wire to the PV module frames, the ground wire itself, and a ground rod driven into the earth at the base of the pole. Lay-in lug kits, available from solar energy equipment resellers, are appropriate for long-lasting, corrosion-free connections between the ground wire and the module frame. Lay-in lugs are designed to accept wire from the side, so the hassle of feeding the ground wire through successive lugs is eliminated. Lugs should be either bronze or stainless steel. They'll come with stainless mounting bolts or screws, and star washers that will cut through the anodizing on the module frame (ensuring a low-resistance connection). Low-cost aluminum lugs are not suitable, since the fastener will be exposed to weather in this application and corrosion will result. Only the module grounding locations identified on the modules themselves should be used. Before you begin fastening the lugs to the module frames, plan the route the ground wire will run between each module, and then down to the combiner box. 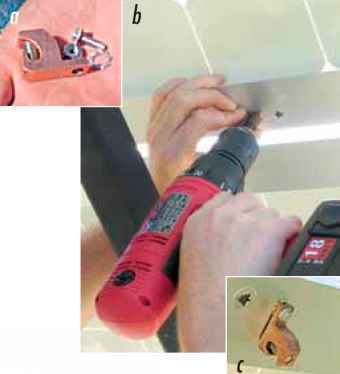 Use a cordless driver to fasten the lugs to the module frames. Once the lugs are installed, it's time to run the ground wire from PV frame to PV frame, and then route it into the combiner box, where it will terminate at the box's equipment-ground lug. 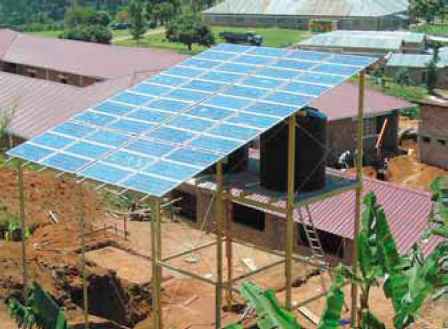 To ensure the lowest resistance electrical path, equipment-ground wire installed on PV arrays should be continuous. On the array, I always use #6 (13 mm2) stranded, bare copper wire, which is more flexible than solid. Trying to bend #6 solid wire in the tight radiuses required when grounding module frames is not recommended. In some cases the NEC will allow smaller-gauge ground wire to be used, but I opt for #6 since it will better resist any physical damage. Next, pound a ground rod into the earth at the base of the pole, outside the edge of the concrete footing. 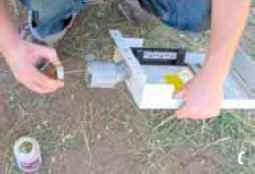 Driving the ground rod at an angle can help you get it in all the way if bedrock is close to the surface. Once the rod is driven, run #6 bare, solid, copper wire from the combiner box's ground lug, down along the vertical conduit, and then over to the ground rod. Where possible, I like to use a ground rod clamp approved for direct burial, completely bury the ground rod, and trench the ground wire in. This looks better, and won't trip people or animals if they pass by the base of the array.